The scriptwriters make some rather extensive additions and changes to the plot, which is fairly understandable, considering the fact that the story itself is very thin. Most importantly, the plot is shifted from past to present tense. Second, Japp and Sgt. Jameson from Murder in the Mews (replacing Inspector Miller from the short story), and Miss Lemon are added to the story. Third, several plot points are added, including the collapse of the Imperial Trust, Miss Lemon's stock speculation (! ), a clue of discoloured cigarettes at the hotel (due to the blackened teeth), an entire subplot concerning Reginald Dyer (who is involved in some shady business in the short story but here becomes a slippery crook), an expanded back story for Lester (including a distressed wife), modern police work at Scotland Yard (see also the adaptation of Four and Twenty Blackbirds), a chase scene (of course), Poirot's bank account (which seems to be overdrawn, but is later revealed to miss a bill from Poirot's 'naval secrets case' - a reference to the unfilmed story "The Submarine Plans" perhaps? ), and a game of Monopoly between Hastings and Poirot (a running joke throughout the episode). Fourth, Lester becomes an investment adviser (as opposed to a 'young bank clerk'), Fifth, Japp discovers the opium den through one of Dyer's contacts, and finds both Dyer and Lester down there. All in all, the story is changed almost beyond recognition. That, however, is not necessarily a bad thing. After all, the original story really only served one purpose, that is for Poirot to explain that Hastings shouldn't make speculative investments, so there was definitely a need for a more extensive plot to make it work as an adaptation. To a certain extent the changes work - and even make sense - so I suppose we should consider this adaptation a moderate success. Bennett makes excellent use of the locations for this episode, particularly the recreated area of Chinatown. There's also some rather nice scenes at the bank. In Peter Haining's book on the series, Bennett describes the choice of location. 'We wanted an authentic look, and the Civic Centre (in Essex) is in very good condition. The interiors we used were just what we needed and very official looking, too. The council offices made for plush banker's rooms and the whole effect was Thirties to a tee' (p. 49). Columbia Road and Ezra Street in Bethnal Green became a replica of Chinatown. Once again, the attention to detail is extraordinary, and the production designers have done such a good job. For location photos, see this link. The soundtrack is good and somewhat oriental in tone. I think it was done by Fiachra Trench, who stepped in for Gunning through most of Series Two. One of the scores, for the chase scene, will be reused in The Kidnapped Prime Minister. This episode introduces Hastings's hunch for bad investments (giving the wrong advice to Miss Lemon), a character trait we will see in several future episodes (see, for instance, Lord Edgware Dies). There aren't really any stand-outs as far as guest actors are concerned. Anthony Bate does a decent job at portraying Lord Pearson, but none of the performances are that memorable, really. I have to say that Poirot and Hastings playing Monopoly together (and Hastings often doing better!) taxed my ability to suspend disbelief. I realize that's saying something, because there are a lot of other things to point to in the series that may seem even crazier, but for me, this one jumps out...maybe because I think of Monopoly as a child's (or young person's) game? And I didn't quite buy the issue with Poirot's bank - hard to associate him with that kind of careless error, actually, although I suppose everyone does it once in a while. I think I would have preferred to find that Pearson was messing with Poirot's accounts because he didn't like having Poirot on his trail, or something. What surprises you about Miss Lemon's investments? It's not something we tend to associate with secretaries (maybe they don't make enough?) Or maybe women in that era...but this is a little past the time in England when women weren't allowed control of money. I think the series makes a lot of the female characters more 'modern' and self-sufficient than in the books. There were a few women in the books who were smart about money (think of the Blacklock sisters in Marple) - although, most of them usually ended up as either murderers or victims. Monopoly was brand new in 1935/6 and was very much an adult game. 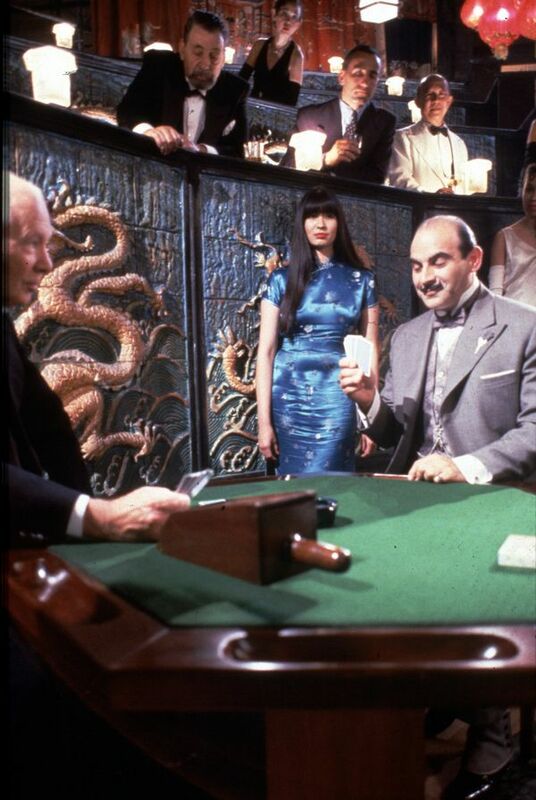 It fits the theme of money management and mistakes that Poirot would be shown to be fallible in depositing a payment. The story is odd and doesn't work as well as many of the others, partly because it is so hard to believe that an addict would retain such an important job. Wu Lin did not speak with an American accent, and although there was other evidence, Pearson not meeting Wu Ling but knowing that guy at the bank was not Wu Ling wasn't that suspicious, could have seen a photo or spoke to him in English on the phone. Poirot is great, aren't many mistakes!